The New York Post's editor says "it is necessary for us to take this step"
One memo says move is to "underscore how seriously we are taking this matter"
New York (CNN) -- News Corp. has ordered New York Post employees to "preserve and maintain" documents related to possible phone hacking or bribery of public officials, according to two documents circulated Friday to the newspaper's staff. The multinational media company has been embroiled in a scandal related to alleged phone hacking in Great Britain that has resulted in the dismissal and arrest of many former editors and executives. But the documents -- which were provided to CNN by Virginia Lam at Rubenstein Communications, which represents the Post -- suggest that this issue may be a concern in the United States as well. "Effective immediately, and until further notice, you and your staff must comply with the following directive: do not destroy, discard, alter or change any potentially relevant documents ... even if such documents or materials would otherwise be routinely discarded," the legal department of News Corp. wrote in one memo. That document states that the notice is not being sent because any employee has done anything wrong or illegal. But, the memo adds, "given what has taken place in London, we believe that taking this step will help to underscore how seriously we are taking this matter." The legal department memo tells employees the mandate is concerned with anything that indicates one "accessed telephone and/or other personal data of third parties without authorization" or "made unlawful payments to government officials in order to obtain information." Staff are told that everything from social media postings to handwritten notes to voice mails and other such material should be kept, it is "related in any way." The New York Post is owned by News Corp., which operates a host of other properties, including The Wall Street Journal, The Sun and Fox News. The legal memo states that failure to "collect relevant documents ... may prevent the New York Post from protecting its interests." 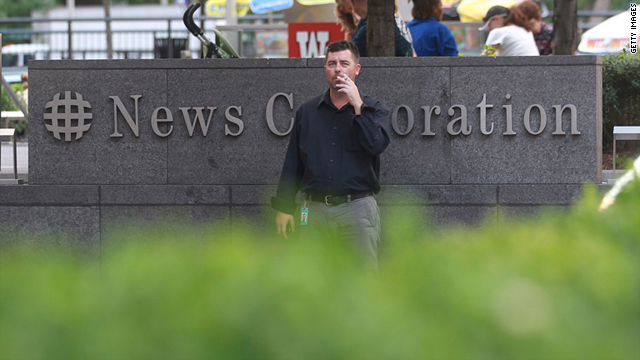 In a message to staff after the memo was sent, New York Post editor-in-chief Col Allan reiterated that all of the paper's employees "have been asked to do this in light of what has gone on in London at News of the World," a reference to the former British tabloid also owned by News Corp.
"As we watched the news in the U.K. over the last few weeks, we knew that as a News Corporation tabloid, we would be looked at more closely," Allan wrote. "So this is not unexpected." The editor said that this directive does not mean that staffers will be forced to disclose "all legitimate and lawful journalistic sources in accordance with the law." Still, he also insisted that "your full and absolute cooperation is necessary." "Given what has taken place in London, it is necessary for us to take this step," Allan said. The development in the United States comes as controversy continues to swirl in England, where the scandal has rattled the foundations of that nation's press, police and political establishments. Journalists from News of the World stand accused of hacking into the voice mail of potentially thousands of people, and of bribing police. This scandal led the company to shutter the paper, one of the best-selling in the English-speaking world, on July 10. It also prompted two top police officers to resign and has put pressure on British Prime Minister David Cameron, who hired a former editor of the newspaper to be his spokesman. The well-known CEO of News Corp., Rupert Murdoch, also is among those who have been criticized in the scandal's aftermath. On Friday, British lawmaker John Whittingdale asked James Murdoch and Rebekah Brooks to clarify some testimony they had given to Parliament and that has since been called into question. Murdoch is Rupert's son and the deputy chief operating officer for News Corp., while Brooks is a former News of the World editor who resigned on July 15 as an executive at News International, the media conglomerate's British arm. She was arrested and questioned two days after stepping down. A statement issued Friday, meanwhile, on behalf of private eye Glenn Mulcaire repeated his apology to those hurt by his actions -- and suggested he did not bear sole responsibility. Mulcaire, first employed by News of the World from 2002 as a private investigator, was jailed in 2007 after being convicted of intercepting royal voice mail. When police arrested him in 2006, they seized 11,000 pages of documents with the names of 3,870 potential victims of illegal eavesdropping. "As an employee, he acted on the instructions of others. There were also occasions when he understood his instructions were from those who genuinely wished to assist in solving crimes," the statement said. "Any suggestion that he acted in such matters unilaterally is untrue. In the light of the ongoing police investigation, we cannot say any more." CNN's Samantha Stamler contributed to this report.